He let the last of the alien sensation finish rolling through him; let it dissipate to nothing, before he finally opened his blood-red eyes. “A rich, Mohammedan body to this one,” Sebastian mused. He swirled the cylinder of blood ever so slightly in the room’s sparse, pomegranate lighting, afforded by the lone brass lantern atop the great mahogany desk. “Blood Dealer” tells the story of an ancient and jaded vampire who, betrayed by his supplier, ventures into the city to set things right. Even more blood and betrayal follows. There’s some lovely blood magic in this one and I might be the only author to contemplate the notion of vampire slaying via silver-nitrate blood transfusion. In trying to find a publisher for this tale, I learned first-hand how little interest there is in vampire fiction these days. There’s just so much of it out there, regardless of how little the myth is explored beyond the classic models in mainstream fiction. 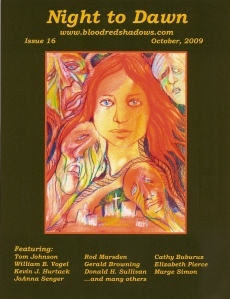 As such, the tale saw publication under the vampire specialist “Night to Dawn” magazine — issue #16 to be specific. If you’re interested in reading the full tale, you can obtain a copy here.